The recent Stanford U.S.-Russia Forum indicates that the “reset” between two countries is in full swing. The buffoonish leader of the Yabloko party took the floor in a session of the Russian State Duma and began severely criticizing United Russia, LDPR and the Communist Party. After the critique, the body adopted a Yabloko-sponsored bill, while one from United Russia failed to pass its final reading. This wasn’t a scene from a film script, but it wasn’t a movie either. 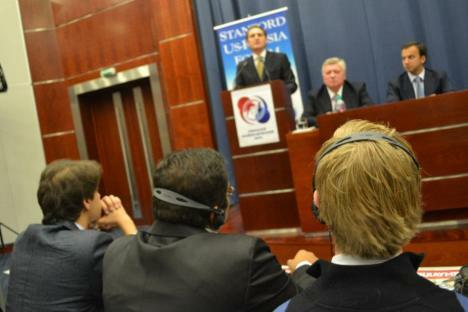 It was a role-playing game called State Duma simulation, conducted as part of the Stanford U.S.-Russia Forum (SURF). Since 2008, SURF has been sponsoring semi-annual educational exchanges, bringing together 20 American students and 20 Russian students from elite universities for meetings in Moscow in the fall, and Stanford in the spring. This year’s Moscow session took place from Oct. 18-22. SURF is an affiliate of the Center on Democracy, Development and the Rule of Law at Stanford University and the New Dialogue Foundation established in Moscow by one of the SURF Co-Founders, David Zokhrabyan, in May 2010. The foundation won the State Club grant in August 2011 to implement the SURF 2011-2012 Exchange Program. Basically, the funding comes from Stanford University and its Russian counterparts - Moscow State Institute of International Relations (MGIMO-University), the National Research University, the Higher School of Economics, and the Academy of National Economy. The Stanford U.S.-Russia Forum began as an attempt to establish closer ties between the two countries. Two American students, Sam Stone and Anda Gansca, were Stanford students who were participating in an exchange program at the Academy of National Economy in Moscow when they came up with the idea of occasional meetings with their Russian friends David Zokhrabyan and Vladislav Malashenko, who were the leaders of the Political Club in the Department of International Affairs of Moscow State University. By chance, SURF was established few months before the official start of the “reset” and fortunately found itself in the right place in the right time. The forum’s main goals are to work towards the reset of U.S.-Russia relations, and encouraging partnerships in fields ranging from politics and economics to nuclear energy and security. The students conduct collaborative research on these problems, which must involve Russians and Americans as well as an advisor. The groups are expected to come up with a research paper and a set of recommendations that will strengthen the Russia-American partnership. The results will be presented during SURF’s spring session, at Stanford, and then published in the SURF journal. Zokhrabyan pointed out that previous SURF conferences allowed students the opportunity to have contact with Russian presidential adviser Arkady Dvorkovich and former U.S. Secretary of State Condoleezza Rice. This year, the list of experts is made up of prominent pundits like Alexei Arbatov and Dmitri Trenin (Carnegie Moscow Center), Viktor Kremenyuk (Institute for the US and Canadian Studies at Russian Academy of Science), Elena Panfilova (Transparency International), Bernard Sucher (Venture for America) and Robert Pszczel (NATO). In addition to roundtable discussions with experts, the latest SURF conference also included a visit to Russia’s State Duma, where participants talked with United Russia Deputy Svetlana Khorkina and got an up-close look at the problems facing the Russian parliament. The visit informed the next day’s activity – the Duma simulation.